Dr. Ben-Ari criticizes yeshiva dean who announced he rejected state in Disengagement, warns he didn't learn the lesson of the Pharisees. Former MK Dr. Michael Ben-Ari, chairperson of the Otzma Yehudit party, spoke to Arutz Sheva on Monday about an article published last Thursday by Rabbi Shmuel Tal, dean of Yeshivat Torat Hachaim which was located in Gush Katif until the 2005 Disengagement plan. In the article which has raised an intense debate over the proper relation between religious Zionism and the state of Israel, Rabbi Tal wrote that he rejected the state following the Disengagement in which all Jews were expelled from Gaza, as well as four towns in Samaria. "We need to be cautious for the honor of Torah scholars and this is a Torah great and a gifted person, but when there is a desecration of God's name one must respond," Ben-Ari told Arutz Sheva. "The struggle between the left and the right in Israel is not over 'territories,' but rather it is a struggle over the question of whether or not God remembered His people. Is (the establishment of the modern Jewish state) a divine process, or an historical traffic accident." "The uncertainty regarding the redemption is not new, but the isolationism (from the state) that Rabbi Tal expresses in his path from an historical perspective brings to mind the Judean Desert cult," continued the ex-MK, who holds a PhD in Land of Israel studies and Archaeology, referring to a cult from the Second Temple period. That cult "dealt with 'I saved my soul,' and viewed all those who were unlike them as wicked and people of falsehood. From them emerged the self-righteous Christianity." Ben-Ari, whose research largely focused on the Jewish revolt against the occupying Roman Empire, noted on the long struggle over the identity of Judaism during the Second Temple period. "The victory of the Pharisees (the forerunners to Rabbinic Judaism - ed.) did not come in one day, but even in difficult days they didn't give up. At most they hid out of fear of being persecuted, but not out of despair." 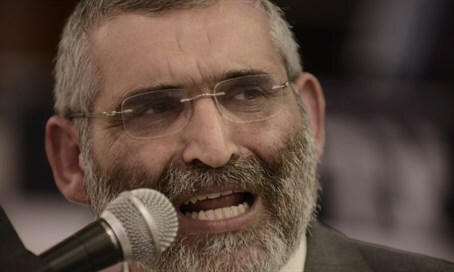 "Rabbi Kahane beat you to it"
The former MK argued that those who shut themselves up in yeshivas to study and disconnect from the state do not help the Jewish nation. "This accusation (of Rabbi Tal's) saying that everyone here (in the state of Israel) are sinners - I want to recall here (the legacy of) Rabbi Ovadia Yosef; (back when) I was a child in Tel Aviv and it was a spiritual wilderness the rabbi struggled for there to be another Talmud Torah (religious school), another lesson from synagogue to synagogue, another quiz, and like that a revolution was born." He recalled that "as a youth I couldn't go into an auto garage...it wasn't possible. Everything was full of abominable (immodest) pictures, today you go into a garage and there are pictures of Rabbi (Yitzhak) Kaduri. The synagogues are packed from two in the afternoon on Shabbat with Torah lessons - that's our role, to make a change - but those who give up lend strength to the enemy." Ben-Ari addressed Rabbi Tal, and warned him that his words are not new but that they transgress fundamental principles. "We are students of (former MK) Rabbi (Meir) Kahane, one of the great critics of the state of Israel," Ben-Ari said of his Otzma Yehudit party. "Everything that Rabbi Tal writes now, Rabbi Kahane wrote much sharper things, Rabbi Kahane didn't need the expulsion (from Gush Katif) in order to get it, but at (Rabbi Kahane's) Yeshivat Hara'ayon Hayehudi we said halel with a blessing (on Israeli Memorial Day)," he said, noting how Rabbi Kahane taught to thank God for the Jewish state and work to improve it, not reject it. "We are not doubtful in giving thanks to God, you have to dance that the state of Israel arose because without the state of Israel my parents would not have made aliyah to Israel from Afghanistan (and Iran), and maybe today I would be a Taliban fighter," he added jokingly. Comparing the rebirth of the modern Jewish state with the end of the Babylonian exile, the ex-MK noted that "even during the time of the return to Zion there were those who desecrated the Shabbat here and embraced foreignness, and despite that the prophet says of (King) Cyrus who worshiped idolatry that he was a partner in the return of Israel to its land." "Rabbi Tal is truly one of the Torah greats of Israel, but I say to him, Rabbi Tal go out and struggle for the identity of the state."